On Sunday we were listening to some of the 80's hits Tamil songs. The famous song from Rajini's movie "then madurai vaigai nadhi dhinam pAdum thamizh pAttu " was telecasted. While we were thoroughly enjoying the song something struck the mind hmmm... we had not blogged about the famous Madurai. Last month we had been to Madurai. Wow what a lovely place? If you question what is it famous for? Everyone will tell immediately that Meenakshi Amman temple. We have heard "Madurai Arasalum Meenakshi" a song from the Tamil movie Thirumalai Thenkumari. Apart from the famous Meenakshi temple it has got other treasures also. The famous Astanga vimanam in Koodal Azhagar temple, Azhagar Koil, Vandiyoor Teppakulam (tank), Tirumalai Nayak Mahal, two Arupadai veedu (abode of Lord Muruga) namely Tiruparankundram and Pazhamudir Cholai etc. Last but not the least Madurai is also famous for its Jasmine flowers. In olden days Madurai was famous for Sangam Vaithu Tamil Valartha Madurai. 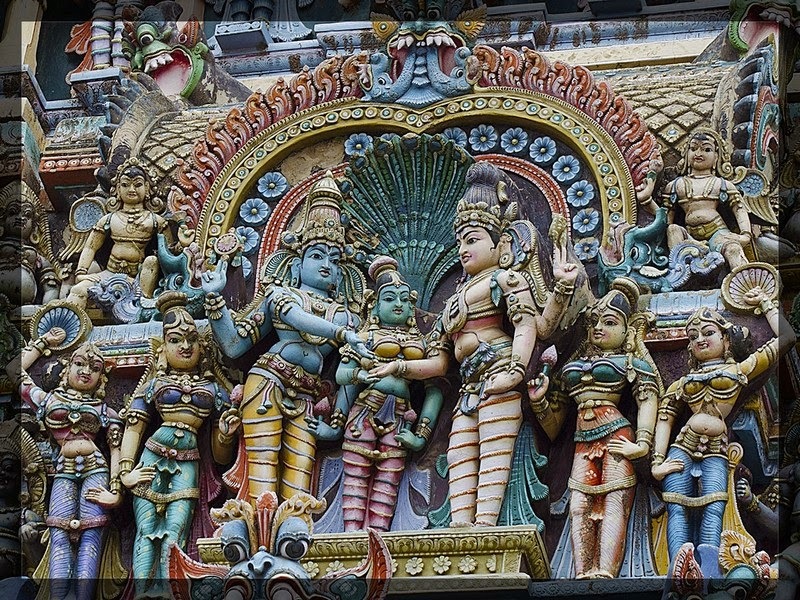 This blog is all about Meenakshi Amman Temple. More of Madurai and near by temples will be posted in our upcoming post. 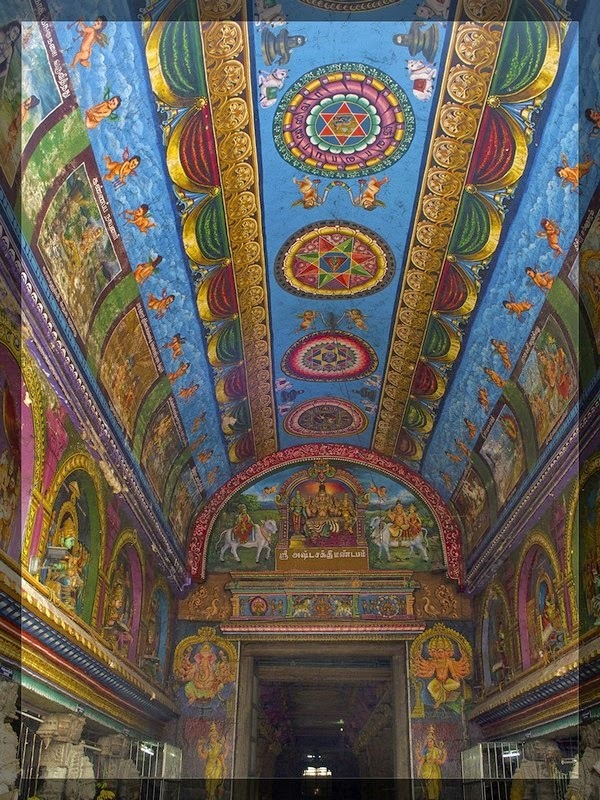 A temple dedicated to Fish shaped eye deity Goddess Meenakshi. 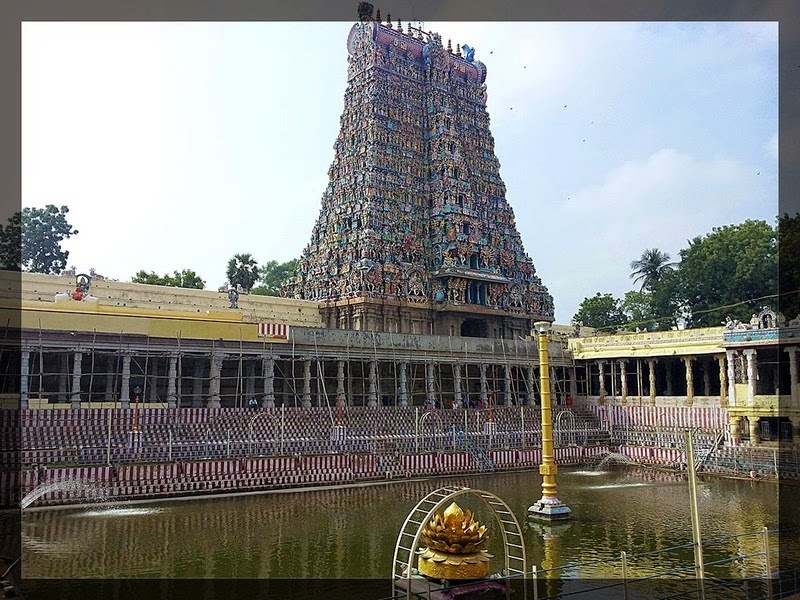 This temple is located on the bank of the river Vaigai. History: Once there was a Pandya king by name Malayadwaja Pandya who was ruling Madurai. His wife name was Kanchanamalai. They were childless for many years. So they performed the Putra Kameshti Yagna. 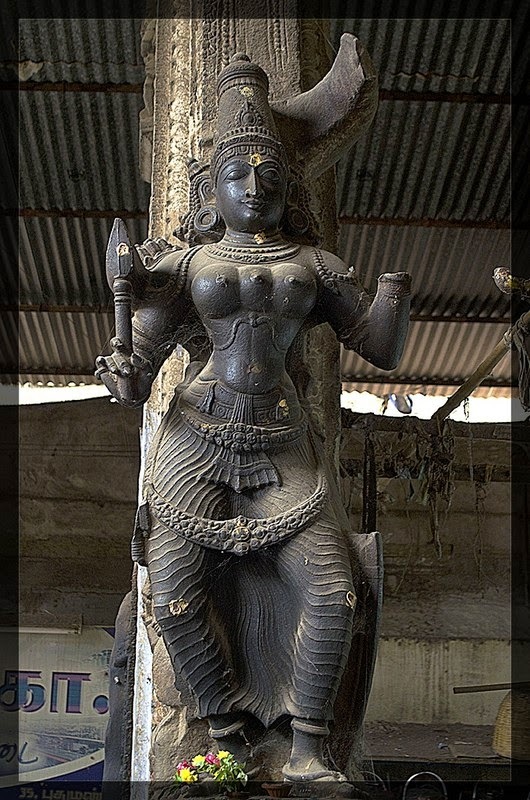 Goddess Parvathi emerged from the Yagna with 3 breasts. The voice from the heaven told that the third breast will disappear as soon as she sees her better half. They named her Tadaatakai and she was trained in all Sastras, she became princess and ruled the kingdom. Goddess Meenakshi came to Kailash and after seeing Lord Shiva her third breast disappeared. When marriage was fixed, Lord Kallazhagar was asked to come and give Goddess Meenakshi as kannika dhanam to Lord Sundareswar (Shiva). Lord Shiva's servant Gundhodhara had the large feast. He was so thirsty that all the water got over. Seeing this Lord Shiva told Gundodhara "Vai kai" meaning keep the hand on the land. Immediately water splashed and quenched the thirst of Gundhodhara. So the river was called Vaigai. Kallazhagar was not able to come to the marriage as there was a flood. During an auspicious hours the marriage took place with the help of another Koodalazhagar Perumal. Hearing that the marriage took place he felt insulted and returns back to Azhagar koil. The above said story is celebrated as a Chithirai thiruvizha (festival) held in the month of April to May. Lakhs of devotees come here to witness the same. 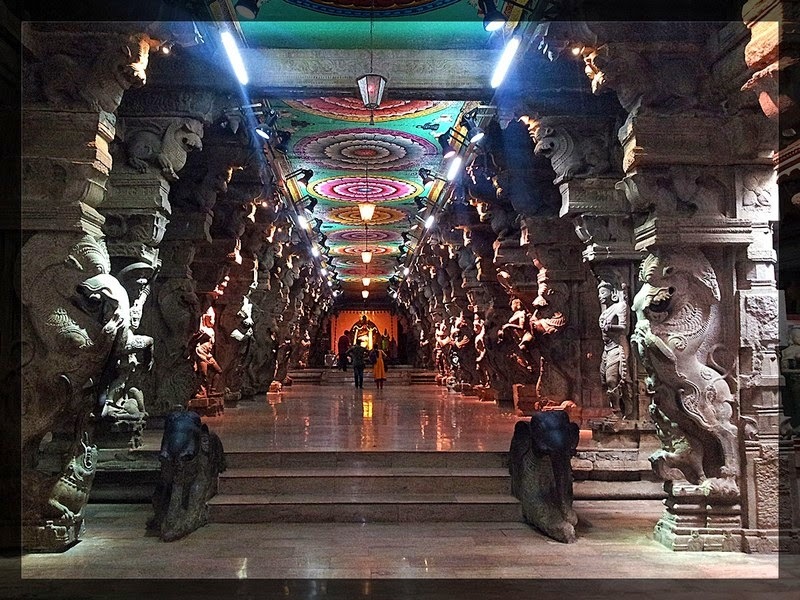 Sculpture, Golden Lotus Tank, Majestic Mukurni Ganesha, Velli ambalam, Thousand pillars hall all add beauty to this temple. The towers are adorned with intricate details and beautiful sculptures. 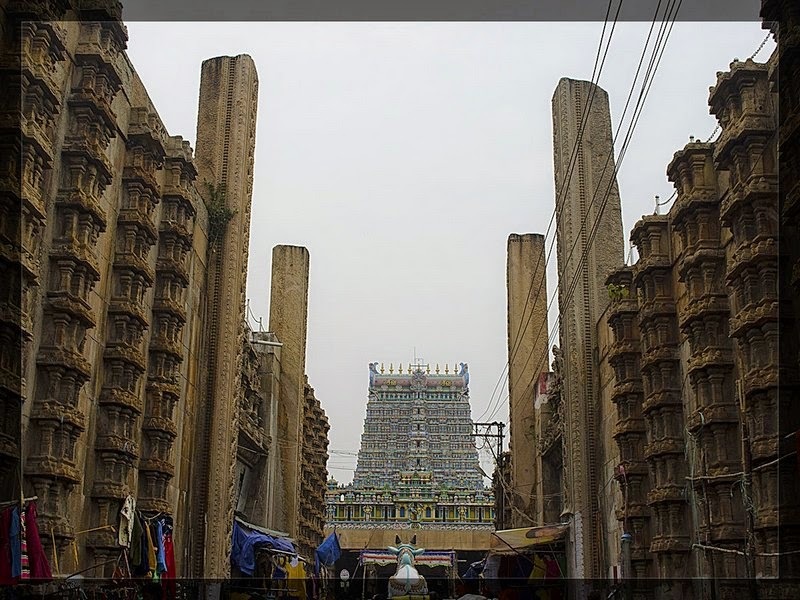 The North tower is called as Mottai Gopuram (bare tower), as most part of the tower does not have sculptures. 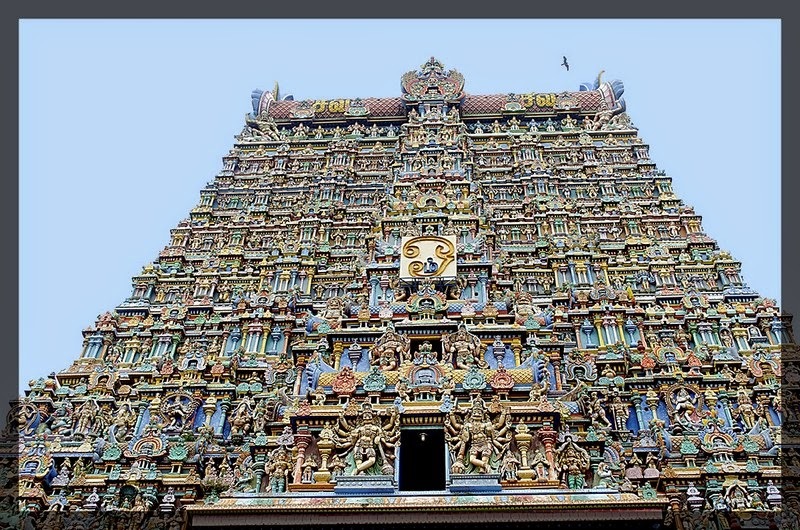 It is said that all the towers of Meenakshi Temple was built overnight by the Bhutaganas and finally when the north tower was being built it became morning. So they left this tower incomplete. Three ‘kurunni’ (an unit of measurement) of grains are used to make big ‘modakam’ (a dish made of rice flour) as an offering to this Ganesha. Hence the name ‘Mukkuruni Pillaiyar’. Smiling Goddess welcomes all devotees to Madurai. She is the avatar of Goddess Parvati. While entering the Sundareswar Swamy's sannidhi (sanctum) please lookout for the beautiful dancing Lord Nataraja on the right side of the sannidhi. You could see some difference from rest of the Nataraja found in other places. What is it? This is the only place where Lord Nataraja has his right leg lifted instead of the usual left leg. It is said that the Pandhya king once wanted to learn the dance. So he appointed a teacher and started learning dance. While practicing he felt pain and thought that even for Lord Nataraja posing with left leg raised will make tiresome. So he requested Lord Nataraja to change the position of his leg. On seeing his pure devotion Lord Nataraja changed his posture. Outside the Sundareswar sanctum one could find Goddess Saraswathi, Durgai, Lord Dakshinamoorthy, etc. To the both sides of Goddess Durgai, there are elephant sculptures. It is said that this elephant ate the Sugarcane? Hmm... interesting story. The story goes like this. Once the Pandhya King heard about Ellam valla Siddhar who was performing various miracles in the city. He was summoned by the king to the palace, but the Siddhar (saint) refused. So the king went to the temple and asked the Siddhar to prove his extraordinary powers. He asked him to make this stone elephant to eat the sugarcane. To his surprise the elephant came to life and ate the sugarcane. Not only this, the elephant also snatched the king's necklace. The king immediately fell at Siddhar's feet and ask for apology. Even now the event is celebrated every year. The event is planned to be held on 15th January 2015 (1st day of Tamil month Thai). 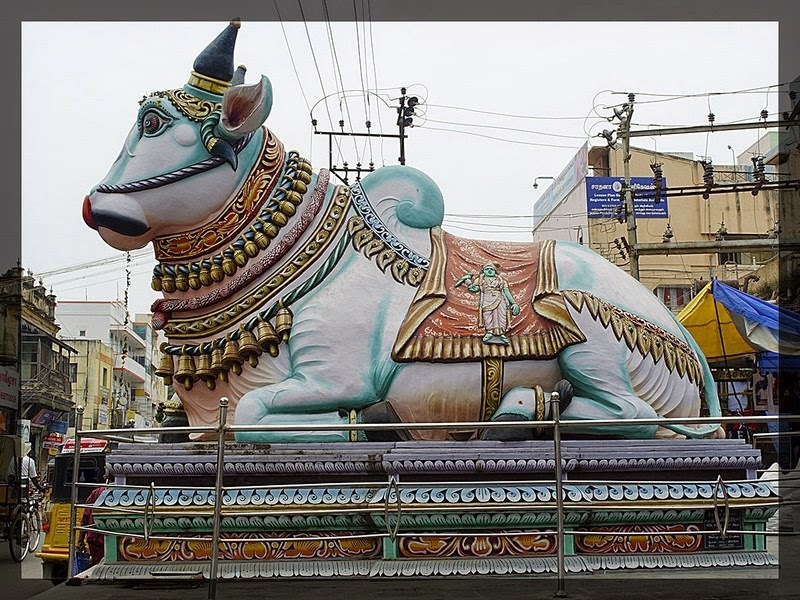 Make sure to witness the same if you are planning to visit Madurai at this time. This has about 985 pillars beautifully seen in rows. Different statues are being displayed. There are paintings depicting the Thiruvilaiyaadal and other stories. One can find Musical Pillar which produces musical notes when struck with a tool. This tool is not there. Try striking with your hand and listen to this. They are there at the right as well as left corner when you enter Aayiram Kaal Mandapam. Temple timing is subject to change during festival. Camera/Video not allowed inside temple. If you want to take photo inside the temple premise, one can take using mobile. But need to pay Rs. 50 at the counter.